Hello dear people! We’re just back from Denver. Did I even mention we were going to Denver? I don’t think I did. There were more important things to talk about! But, in spite of the lack of public acknowledgment, that is, in fact, where we were for the last week. We were at a distilling conference, which, as you may suspect, is a whole lot cooler than many of the conferences one could find oneself attending. Craft distillers are a pretty good bunch, as far as I could tell from my observations of the 600 or 700 or so that were at the conference with us. Quirky, driven, creative, Jacks and Jills of all trades, and quite friendly besides the occasional curmudgeon – there always has to be at least one curmudgeon in any bunch. I didn’t make a ton of connections. I’m an absolutely terrible networker! I clam up and get shy and awkward and can’t think of a thing to say to anybody, so I float off around the edges and watch people talk. But, there were some smaller, more intimate gatherings where I could actually connect with people and those people I found to be stellar ones! Also, the sessions were generally useful and fascinating. We learned about variables in aging spirits, how to work with wholesalers, innovations in packaging, women in distilling, surviving an audit, how to “nose” (that is to say, smell) unwanted compounds in your spirits. Good stuff. Now we’re back and the refrigerator is starkly empty. I need to do a major restock. And I need to bake some bread. I’m no expert, but from what I’ve read, I suspect the reasons for this change in bread are complex and many. Part of it, I am quite convinced, comes from the changes in the grain supply with the industrialization of agriculture. The wheat available today is not the wheat people ate for hundreds of years. The wheat available to us now has been bred to be durable, shippable, highly storable, easy to harvest, and high-yield, but not to be nutritious or flavorful. The potential goodness of the grain has been bred right out of it, leaving instead a highly gluten-filled, hard to digest, inflammatory commodity. The other thing I’ve heard about is the problem with commercial yeast. I haven’t looked into this as much as I really ought, so I don’t know in depth exactly why commercial yeast is less healthy, but I’ve long known that baking with wild yeasts (ie. a sourdough starter) breaks down proteins in the grains that releases more nutrients and makes them all more accessible and digestible. Sourdough (real sourdough, a lot of commercial sourdough is just commercial yeast raised bread with vinegar added to make it sour) that has gone through a slow-rise is actually pretty low in gluten as well! These, essentially, are the reasons why I started trying to bake all of our bread, after acquiring Frances, my sourdough starter. It took us a while to get comfortable with each other, Frances and me. I did a bunch of reading on how to maintain a sourdough starter (here is a good tutorial, and here is another one), and I gradually learned the schedule on which Frances needed to be fed if I kept her in the fridge most of the time. And then I started to read books on bread baking like it was my job. But, even following the instructions to the letter for the wild yeast breads in some of these books, I wasn’t quite getting the results I wanted. Probably because I had some very particular wants. I was looking for a bread with large air pockets, a lightly tangy and elastic (not crumbly or dense) crumb, and a crisp, hard, crackling crust. Not really the best sandwich bread perhaps, since sandwiches tend to be better on bread with a tighter crumb, but I knew what I wanted. So, I kept experimenting and nabbing techniques from different books. It’s taken at least a year and hundreds of loaves (almost all of which were quite good, so there was nothing lost in the effort. But they weren’t perfect. ), but last week in my efforts, I made a bread that was pretty dang close to 100% hydration (that is, equal weights of flour and water), and used a slow rise combined with a technique I’ve only recently discovered, of stretching and folding rather than any kneading. I baked the bread in my Dutch oven, and when it came out, well actually when it came out it was quite stuck in the Dutch oven and I was feeling too impatient and I tried to pry it out, so I kind of ripped some chunks off of it and broke a wooden spoon in the process. Unnecessarily, since it would have loosened up and come out by itself if I’d waited five or ten minutes. But, when it had cooled enough to eat with a good smear of butter, I discovered it was perfect. It was truly my perfect crusty loaf. Joel declared it world class. I was worried it was a fluke. So, since getting home yesterday, I immediately set some dough to rise to try it again. I just took the loaf out of the oven and people, it is gorgeous. Gorgeous! Whee! I’m so excited for lunch now! Anyhow, I can’t actually promise this technique will work for anyone else. I think bread baking may be a very personal thing. There’s a certain amount of relationship building that has to happen between you and the sourdough and the bread so that you can understand it and tell when it needs more or less moisture or more or less time. But, I thought I’d give you my formula anyways, so you can give it a try. If it works, you are in for a treat. I use a pretty large amount of sourdough starter in this loaf. Using more starter makes for a slightly faster rise and a more lightly tangy flavor. If you want a really tangy flavor, you can use less starter and let it rise for a longer time. All of the measures for the bread are by weights. If you’re going to bake bread, you should really do it by weight. I still use cup measures for most baking I do, but for bread, since it’s all about weight ratios, you really want a scale. I’ve given cup equivalents, but I make no guarantees about them! 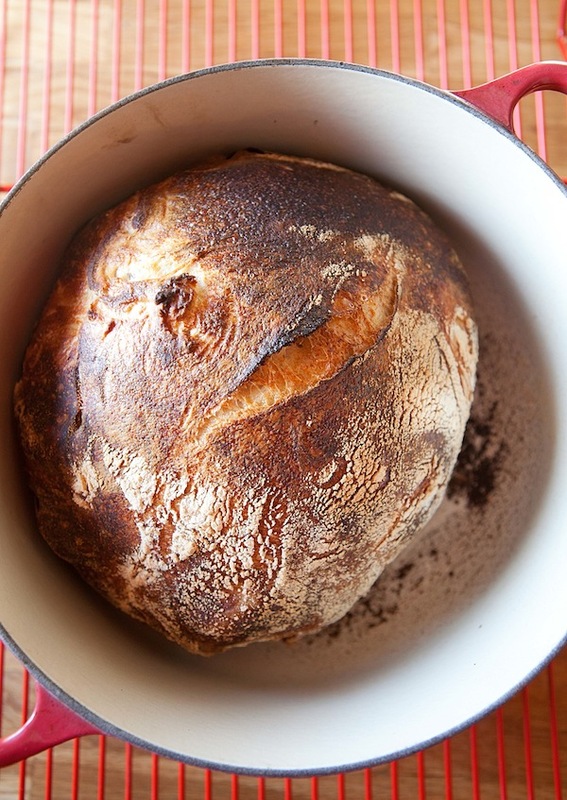 In a mixing bowl, stir together your sourdough starter, flour, salt, and water until totally combined. It should be a pretty shaggy sticky mess. Oil a separate bowl, which you will put the dough in for its rising. Flour your hands well, take your dough and stretch it between your hands. Fold the right side 2/3s of the way over the other side, then fold the left side over this, as if you were folding a letter. Turn the dough a quarter turn and repeat (so now you’re stretching and folding what were previously the top and bottom sides). You can do the stretch and fold either on a well greased bit of counter space (I don’t use flour because I don’t want to incorporate extra) or you can do like I do and do all your stretching and folding in the air above the bowl. Place the dough seam side down in the oiled bowl and cover the bowl with a damp kitchen towel or with plastic wrap. Leave at room temperature. Set a timer for one hour. After an hour, wet your hands well to keep them from sticking, gently take the dough out of the bowl and stretch and fold just like you did before, right to left then quarter turn and right to left again. Place the dough, seam side down back in the bowl and cover. Set the timer for another hour, and after that repeat the stretch and fold. You should notice that the dough is gaining structure and getting slightly less sticky to work with. Set your timer for one more hour. Repeat the stretch and fold, and this time, after finishing stretching and folding, pull all the sides under the dough to make a round loaf shape and place on a well floured surface. Take another mixing bowl about 2 times the size of the bread dough, place a linen towel in it (it doesn’t actually have to be linen but it should not be a fuzzy terry cloth kind unless you like fuzzy bread) and rub flour into the cloth like crazy. Dust your loaf well with flour too, and place it into the lined bowl with the seam side facing up. Cover the bowl with the plastic wrap or damp towel and place it in the refrigerator overnight, or up to 2 days (my dough is usually fairly puffed by the time I am done with the folding and put it in the fridge because I have a very active starter. If yours isn’t, leave it at room temp. for a couple hours before putting it in the fridge.). The next day (or two), an hour before you are ready to bake, take the dough out of the refrigerator. Let it stand at room temperature for an hour, at this point it should looked puffed, and if you poke it, it should leave a little indent, if not, let it rise for another 30-60 minutes (or even longer, if it needs it. Sourdough has personality, some is more active than others, so you just have to let it take as long as it takes to get puffy.). While the dough stands at room temp. preheat your oven to 475F with a Dutch oven or a bread crock in there. (You need a heavy duty ceramic or cast iron pot with a tight fitting lid, basically, which will generate steam and give the bread a nice crisp crust.) Put a good layer of cornmeal or flour on a pizza peel or a cutting board, and gently turn the bread dough out onto it. I always have to work a little to get the towel off the dough. Do this gently, being sure not to rip the dough – I always seem to have trouble with my dough sticking to the cloth, but everyone always recommends using the cloth, so I keep doing it, but it may work with just an oiled and floured bowl. Use a very sharp knife to make a gash or two in the top of the bread. When the oven has reached temperature, take the Dutch oven out of it. Either slide the bread dough from the peel/cutting board into the Dutch oven, or gently lift the bread and drop it in, cornmeal side down. Cover the Dutch oven, and put it back in the oven. Bake the bread covered for 25 minutes, then remove the cover and bake for about another 10 minutes, or until the bread is deeply browned – chestnut colored. Then remove from the oven, and turn the bread out onto a cooling rack. If the bread is stuck to the Dutch oven (which doesn’t happen often, but it does now and then), just wait. If you let it sit until the pan has cooled some, it will usually release itself. Allow to cool completely. I know this is an awful thing to say, because warm bread is so good, but bread really should be cooled completely, otherwise you’ll arrest the baking process (it keeps baking inside as it cools), and the texture won’t be right. If you absolutely can’t wait, at least let it cool until it’s just a bit warm, then cut off an edge, smear it with lots of butter, and have at it. One thing to note is that because this bread is so airy and crusty, it can be a bit challenge to slice. I’m sure you can handle it, though. I believe in you. *The weather here has been bone dry when I’ve been making this. It has suddenly been getting much more humid, and I’ve been finding I need to add around 50 g extra of flour to the dough to get the texture I’m looking for. Oo, so did you do a white sour dough starter? I like the sound of that, it seems a lot more versatile. Also trying not to buy any more flour types as my cupboards are bursting in my tiny kitchen! Btw have you been reading ken forkish? I feel so much more empowered with the knowledge in his bread book! Am still experimenting with a light molasses and walnut version of his Saturday white loaf. Pretty tasty results so far! I do use a white starter. It’s quite versatile, and I have a reaction to a number of types of whole grains, so I just keep the starter with white bread flour. I haven’t read Ken Forkish yet! Ack! I want to! I desperately want to buy his book, but have also been trying to put a (at least temporary) moratorium on my cookbook spending for the moment. I learned about some of his techniques from a friend though, and love, love, love it! A molasses and walnut loaf sounds fabulous. Your loaf is perfection! I had a starter that I killed, I will have to start another. I love this post, you are so right about the grain industry I will seek out Anson Mills. I love baking bread. but honestly starters intimidate me. I don’t know what I did but I ended up having to throw it away, it smelled really bad. I used 100% saturation method or at least I thought I did. I will check out the tutorial’s you recommend maybe I can figure out what I did wrong, Thanks for the great recipe, can’t wait to try this bread. Well I was gifted the starter, Antonia James sent it to me for Christmas, it could have been compromised in the shipping, she packed in a plastic container and put that container in a plastic bag, it grew out of the container and into the bag and I scraped it back into the container. It was great for a while, I got two good loaves from it, really incredible, fed it on schedule ( I think), discarded some before feeding. What you said makes sense, it could have been contaminated. It turned grey and stopped bubbling and smelled really bad so I chucked it. Going to try again, I won’t be defeated. Thank you so much. 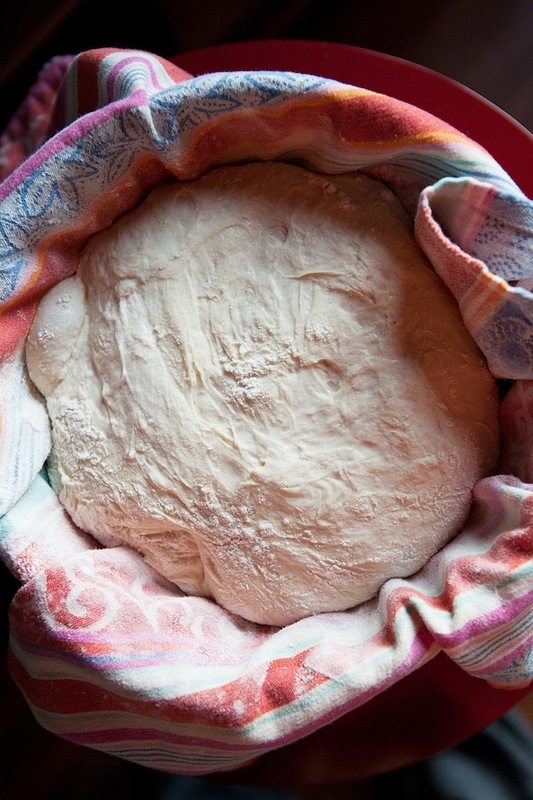 When I saw your photos in my reader, I thought for sure — Jim Lehey’s No-Knead Bread. But I LOVE that this is a sourdough! How can I get a starter? That is probably a very elemental question… maybe I should check out those links. You are so good at life…. you’re an amazing cook, baker, and all your nutritional knowledge is so helpful for the rest of us — I always learn something when I come read your posts! Thank you. I’m trying your polenta and garlicky kale this week 🙂 Also, I love that final photo. It’s inspired and beautiful! A) Thank you for calling me good at life! That makes my day because I was definitely having a day where I was not feeling good at life at all. 🙂 But, I’m glad you find the information useful. B) There are several ways you can get a starter. You can make your own (google it, and you’ll be able to find a number of tutorials); you can order some for example from King Arthur flour; or my favorite method is to get a chunk of starter from someone who already has one. You have to discard some of your starter every time you feed it, so people who have a starter are always having pieces that they could give away instead of throwing away. The trick is finding someone who has a starter. Whichever way you choose, good luck! Ah we just moved away from Denver (there are so many cool craft distilleries there)! On bread, I’m totally with you- every time I bake a loaf I’m in awe of it! Baking bread seems like a miracle to me, and it truly is the stuff of life. SO many craft distilleries. And great cocktail bars too (that were nice enough to make me really good mocktails). And, I love the way you put that, bread really is a miracle. It’s like magic. Hi Emily, what a wonderful post!! I think you’re spot on – it’s a tragedy the way commercial bread is going these days. Hats off to all the farmers who grow heritage grains, and to the bakers who use them. I’m very lucky, we have a baker who uses heritage grains and natural sourdough, AND he bakes in an old fashioned wood fired oven. So it means that I don’t have to bake any more, and still get to eat healthy delicious bread (did I say he only uses organic flour?). I guess your bread never has time to go stale, but if you every had too much, real sourdough bread freezes incredibly well! Oh wow! Lucky you for sure! I envy you big time. Though, I can feel a little less jealous know that I’m starting to get my sourdough technique down. 🙂 And, actually, I do freeze my sourdough sometimes (especially if I make a batch that makes two loaves), and you’re totally right, it freezes beautifully. This looks like the perfect loaf and now I have an intense sourdough bread craving! Thanks for sharing your recipe! And I’ve been getting into trying different heritage grains and flours, which is a lot of fun and more interesting than sticking with regular wheat flour. Isn’t it?! It’s so fascinating to discover the whole huge world of grain varieties and subtypes out there! What perfect timing! 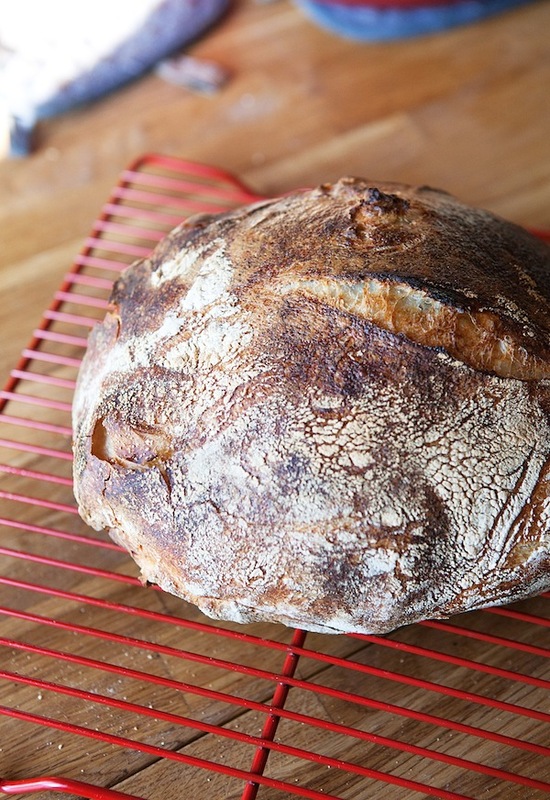 I’ve been searching for just this loaf to make with my sourdough starter (named Fidough). Thanks, and looking forward to checking out your other recipes! Oh my gosh. I love the name Fidough! I’ve been baking bread in a dutch oven since I read Ken Forkish’s book Flour, Water, Salt, Yeast and it is the best bread I have ever made. I highly recommend the book! I love that you use a sourdough starter instead of commercial yeast. 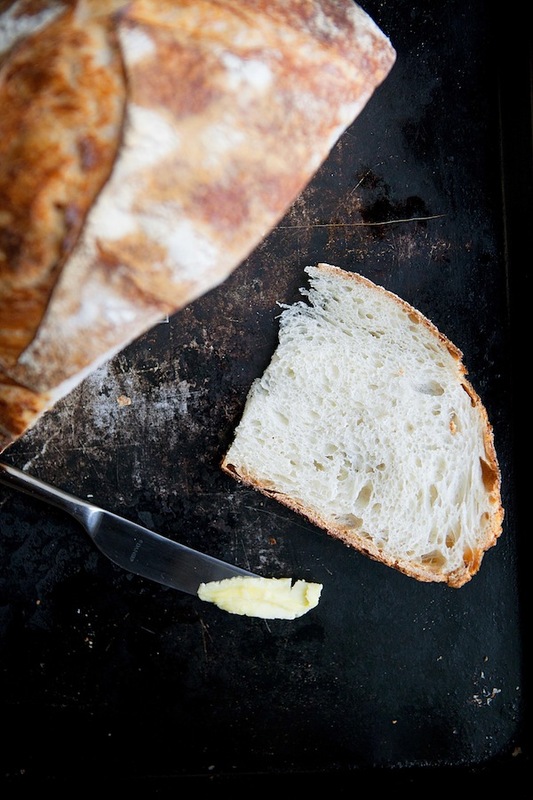 There’s something about homemade bread that’s just really special. You are currently reading My perfect crusty loaf at Five And Spice.